The Girls Scouts at large offer so many opportunities for girls — from age 5 – 17. Our Troop — His Girl Scouts Rock — is a multi-level troop — we have Daisies (grades K -1) Brownies (grades 2-3), Juniors (grades 4-5), and Cadettes — (grades 6-7-8) and Senirs (grades 9 – 10). Why did we choose to have a multi-level troop? It was a simple decision — God talked and we listened. We had several amazing girls who bridged over to Cadettes from Juniors — and they wanted to continue in Girl Scouts. While there are a lot of great Troops in South Florida, we (to the best of my knowledge) are the only Christian Troop — we wanted to be able to provide a Christian Girl Scout experience for our girls who bridged over. Our goal as moms and leaders is to be able to provide an environment for the girls to grow in all ways — in leadership, community service, friendships, values, minds, skill sets (learning new things like sewing, cooking, camping, boating, kayaking, jewelry making, screen printing . . .), and Jesus. We want to be a light for others. The girls have had two amazing years. We completed over 20 service projects that impacted our community on many levels. What a feeling the girls We give the glory to Jesus for all the great works he does in our lives! 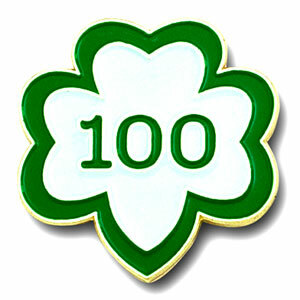 Check out our video at You Tube — and see why Girl Scouts is celebrating it’s 100th Birthday! We have FUN! When her mom related this, I knew we were doing something right. Thank you, Isabella for helping us find our Troop Verse. With Jesus as our foundation, growing our confident girls who recoginize the Fruits of the Spirit are critical to successful leadership, we also are a family that wants to engage moms (and dads) in this journey. Girls Scouts is Fun. Our Troop is blessed . . . be part of the mission to make a difference in your life, the life of your daughter, another girl, and your community! Copyright © Girl Scouts Welcome!